Here are our picks for great events and activities for children and families this weekend. 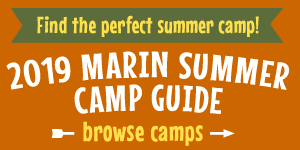 Find more events for the whole week in Marin and beyond in our Family Event Calendar. Inspired by our new Hands-On Harley-Davidson™ exhibit, children will learn about what makes vehicles work by designing and testing pistons that roll, watching engine demonstrations, and interacting with vehicle parts. Museum admission applies. Location: 557 McRenyolds Road, Fort Baker, Sausalito. Event details. We all know how crucial bees are to our food supply, gardens, and beyond. Shouldn’t we learn more about the importance of these fantastic creatures? Come chat with a real Sonoma County beekeeper on the second Friday of the month from 1pm - 2:30pm. Museum admission applies. Location: 1835 W. Steele Lane, Santa Rosa. Event details. This new musical, inspired by Chelsea Clinton’s best-selling book, She Persisted: 13 American Women Who Changed the World, tells the story of a fourth-grade girl whose trip with her class to the museum turns into an adventure in time travel during which she meets inspirational women who are overcoming barriers and making history. For ages 5–10. Tickets: $34 adults, $30 children 2–14, $32 seniors 65+. Location: 2055 Center Street, Berkeley. Event website. Experience your own night at the museum! Explore the exhibits after-hours and discover the deepest depths of the oceans, travel to the tops of rainforests, blast off into outer space at your own private planetarium show, and then settle in for story time after snacking on milk and cookies. When the lights go out, roll out your sleeping bag next to the California Coast tank or the Swamp window face-to-face with Claude the albino alligator. In the morning head over to the Academy Café for breakfast. Cost: $119 per person. Event details. The Yes Theater-Ross Valley for Schools Foundation presents Into the Woods. Cost: $13 online or $15 at the door. Tickets will also be for sale at the Box Office 30 minutes before performance times. Location: 27 Kensington Road, San Anselmo. Event details. Meet us at the Mart for our annual St. Valentine's Festival at the Farmer's Market! We will have heart art, face painting, berry love letter making, tulip bouquets, a photo booth, kids' entertainment from 9:30-10:30 and live music from 12-2. Location: Larkspur Landing parking lot in Larkspur. Event details. The NMC Rummage Sale is a yearly event where you can buy gently loved items for your family at bargain prices. Shop for gently used items such as maternity and nursing items, clothes, toys and gear for babies and kids; home decor items and books organized into aisles for easy shopping. At 2 pm, all of the remaining items are marked HALF OFF the original price. in the back of Novato Gymnastics Center (enter in the rear of building). Event details. Bookmarks hosts its annual Teddy Bear Tea for young children and their families. Delight your children with this age-old tradition. Piping hot cocoa, savory eats and festive treats greet little guests at their beautifully decorated tables. Children will participate in crafts and listen to festive stories read by the children’s librarian, Alicia Bell. Tickets: $35; $350 for a table of 10. Location: Founder's Room, Belvedere Tiburon Library 1501 Tiburon Boulevard, Tiburon. Purchase your tickets here. Pier 39 has planted 39,000 spectacular and colorful tulips throughout the waterfront park. Come for a free guided tour led by Pier 39’s expert landscapers beginning at 10 am daily from the Entrance Plaza. After each tour enjoy complimentary refreshments. Event details. Join us for a fun class all about Valentine’s Day Cookies! We’ll make one of our favorite cookie doughs together, then roll it out and use our Cookie Stamps to emboss them with heart, bee mine, and love designs. Cost: $30 per child, includes Valentines Cookie Stamps. Call the store to reserve your spot: (415) 924-6799. Event details. Bring the entire family to Giants Fan Fest and meet some of the players, autographs, and more. Free admission; parking $10. Takes place rain or shine. Location: 24 Willie Mays Plaza, San Francisco. Event details. That's when we'll do it all again at the fantastic Lake Sonoma Steelhead Festival, held on the grounds of the Milt Brandt Visitors Center! Rain or shine, from 10 a.m. to 4 p.m. Food, wine, beer, silent auction, live music, archery, fishing, tours, demonstrations -- just about anything you can imagine, and it is FREE!. Event details. Bring the fam and join us on Saturday February 9 at Chinatown on Grant and Jackson for a special new event-Choy Sun Doe Day! There will be performances, food, a petting zoo and one hundred Choy Suns passing out red envelopes (to kiddies only, sorry adult people) filled with a sweet treat and possibly a voucher for a toy or money of course. Event details. To commemorate the Year of the Pig, the San Francisco Zoo is thrilled to host Lunar New Year celebrations! Soak up the ambiance of the occasion and marvel at traditional Chinese lion and folk dance performances at 11 am and 1pm daily. Go on a Zodiac Scavenger Hunt through the Zoo to learn fun facts about the animals found on the Chinese calendar. Guests born in the Year of the Pig (1923, 1935, 1947, 1959, 1971, 1983, 1995, 2007, 2019) will receive free Zoo admission on that day. Event website. A very special Valentine's themed class where you will learn to create these cute little cooties, the Love Bugs. This lesson will also cover the topic of high temperature wire, a special type of fusable wire that will be used to give your love bug it's bendable legs and antennae. $40 gets you two bugs to create. Keep one for yourself and give one to someone you love! Reserve your spot here. Location: 1938 4th St, San Rafael. Event details. Make a special Origami Valentine for that special someone. Ages 8 and up. Free. Location: 707 Meadowsweet, Corte Madea. Event details. Storytime and Activities Featuring "All You Need Is Love"
In this book, the beloved song "All You Need Is Love" comes vividly to life, showing that if we follow the music we will see there is indeed love all around us. Enjoy a cookie coloring activity, while supplies last. Location: 313 Corte Madera Town Center, Corte Madera. Event details. Family Art Making offers a free, drop-in art project led by professional teaching artists. Projects change every 3-4 weeks and connect to our permanent collections or highlight our special exhibiton. Make sure to pick up a Discovery Guide to explore the galleries. Artists of all ages are welcome to join. Free and open to the public. Museum admission required for gallery activities found in the Discovery Guide. Location: 50 Hagiwara Tea Garden Drive, San Francisco. Event details. Learn how to make hot chocolate on a stick and chocolate bark. Choose your own flavor for the hot chocolate and toppings for your bark.Then decorate and wrap all the treats you’ve made! Cost: $60 + $15 materials fee. ($15 discount for siblings. Three work-trade scholarships available.) To reserve your spot, call or email Malika Henderson: 415-847-6083 or malikaann@mac.com. Location: 46 Park Road, Fairfax. Celebrate the Year of the Pig with a performance of traditional and contemporary Chinese dance in the Presidio Meeting Room at the Presidio branch of the San Francisco Public Library. Free. Event details. Hearts on the Hill Fundraiser - Indoor Play! Join us for the annual Hearts on the Hill Fundraiser benefiting Kids on the Hill Preschool in Corte Madera! Activites for the whole family: carnival-style games, face painting, arts and crafts, food and drinks (cupcakes! ), a live DJ, dancing, and a silent auction. All activities will be held indoors at the Corte Madera Community Center this Saturday, February 9th from 3:30-6:30 p.m. Admission is $5 and children 2 and under are free! Location: 498 Tamalpais Drive, Corte Madera. Event details. Bring the family to the free spring concert series at Novato City Hall. Doors open at 5:30 pm. This Saturday, risk-taking, pop-savvy, finely honed rock-and-roll from Amanda Brown. Location: 901 Sherman Avenue, Novato. Event details. The Kanbar Performing Arts Center brings the multicultural flavors, movement, live music and fun of Summer Nights indoors to the Hoytt Theater. This Saturday, the Bay Area's own Wake the Dead explode the barriers between Celtic tradition and Summer of Love rock, creating something uniquely joyful. This acoustic sextet reimagines the classic songs of the Grateful Dead and more for a rollicking sonic excursion that has delighted audiences for over 18 years. Admission: $25 public, $22 members; $30 day-of; $10 ages 17 and under. Event details. There's lots of organically grown produce, breads, eggs, and fresh cut flowers, as well as live music, bounce houses, and more. This farmers' market is a great one to take the kids to. It’s located in the main Civic Center parking lot. Event details. Head out to beautiful Upton Beach and learn how to skimboard with ranger staff. We’ll learn the basics of skimboarding through demonstration and practice. A limited number of skimboards will be provided, but if you already have a board, please bring it. Skim’s up! This event is ideal for all ages. Dress in layers and wear sturdy shoes. Don’t forget to bring wet suit, sunscreen, and a towel. Friendly dogs are welcome but must be leashed. Rain will cancel. Location: Meet at the beach near the north parking lot at Stinson Beach. Event details. In preparation for Valentine's Day, this month we celebrate love under the sea with Marine Mammal Parents and Pups in a fun, educational way for both kids and adults. We recommend teaming our free classroom program with a Docent-led tour at 11 am, 1 pm, or 3 pm for a truly immersive marine mammal experience. Event details. Spencer Grey brings dazzling visual illusions and original magic you won't see anywhere else. Audience participation guaranteed! Free. All ages. No sign-up required. Location: Mill Valley Public Library, Main Reading Room, 375 Throckmorton Ave, Mill Valley. Event details. Terra Marin is a progressive and inclusive K-8th grade program, dedicated to honoring the gifts of its students while providing a safe and supportive environment in which they can inquire, explore and challenge themselves both in and out of the classroom. RSVP here. Location: 70 Lomita Drive, Mill Valley. Event details. We will be celebrating by decorating heart cookies for your Valentine! Cost: $6 per person; advance registration required. Price includes one heart sugar cookie, icing and decorations. Location: 7400 Redwood Blvd., Suite #101, Novato. For more info, visit their Facebook page.